If you hadn't noticed already, British Airways' brand new A380, 'Super Jumbo' is at Manston today. The giant passenger jet is due to take-off again in the company of two Red Arrows for filming at 3pm over Dover or so I'm told by Manston ATC. 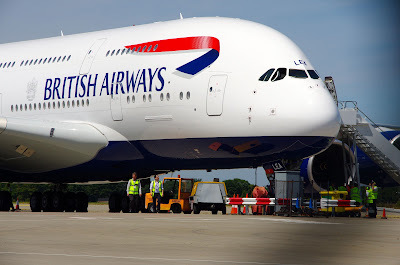 If you plan to have a look, then I reckon the best vantage point is the end of the runway near the Minster roundabout as Manston's runway 28 is presently in use and that way, you may get your hair parted by the A380 as it leaves. "You think that's big, you should have seen the one it came in." A remark made to an American on the pan at Khormaksar when asking what sort of aircraft the Beverly was. Crickey, youre going back a bit talking about Beverly's, last saw one of those in Singapore in the 60's.! I was fortunate enough to up at the roundabout when the A380 did its first run down the runway. With undercarriage up and at speed, it made fine sight. Flew in a Beverly several times, all in Aden and up the route. 1963 - 1965. Also Argosy, Twin Pioneer and DC3. Also travelled backwards in a Beverly at 7000ft. Don't remember seeing a Beverly in Singapore. Plenty of Lightnings, Hunters, Shackletons, Canberras. 1968 - 1970. Missed the A380 but it's around for a while. Sure I,ve got some photos of a few B's at Changhi, 68 I think. I was at Tengah, visited Changi a few times but never saw the big beast. Once flew to Salalah with the doors off. Very noisy. 48 squadron, 1958-60 based at Changi. The big B was followed by a few Argos. And I'm sure this makes little sense to others who read this, but it sure makes a change from the usual political whinging we read on this great blog. Recall flying down from Butterworth to Singapore in a RNZAF Bristol Freighter, probably 64. Butterworth to Gan via Katanayaka in a Hastings and back from Gan to Changi on a Comet in 1963. At Butterworth at that time there were RAAF Sabres, RAF Javelins, Valettas, Whirlwinds and Sycamores with the odd visit by Vulcans. Agree, vintage aircraft make a change from Thanet politics and good to see so many locally who got in a tour before the Wilson withdrawal from East of Suez. 84 Squadron had the Blackburn Beverly, 105 Squadron had the Argosy, whistling T*T, in Aden 62-65. One Argosy landed short of the runway in the sea at Khormaksar, Aden and floated. It was rebuilt and had a Plimsoll line painted underneath the cockpit area. I flew in it from Cottesmore when it was doing air calibration of ILS. Good to see so much chat about old RAF days in the Far East. Having been brought up in Singapore, I can recall many an interesting day spent, as a kid, watching exotic planes from all over landing there. Simon have you noticed in the Gazette that JW has now stated he won't attend scrutiny meetings, so he has stood down as Leader of that political powerhouse TIG Group and now just keeps his Gift SRA from Clive Hart for a Committee chairmanship. As he has recently abruptly departed from both TDC and Parish Council with the expletive b*****ks maybe his time has come to realise that carpet cleaning business is his true vocation and leave Politics to those who truly wish to serve the public. Anyone remember the Brabazon? Led the King's Cup Air Race back in 19??. As did the Comet one year. Not only do I remember the plane, a larger forerunner of the Britannia, but also the man, for I have a glider licence, obtained as a young ATC lad, signed by Lord Brabazon of Tara. Now that really dates one. Very true 9.13. I think worrow has been up to more than just cleaning carpets by all accounts. We will wait for the latest revelations to come about on that front. Saw Airbus take of this morning, 29/07/13. On way to Cardiff. Waggled wings in farewell and pilot thanked ATC for all their help etc. Does this mean this is the last time we will see it? When is the Dreamliner due? Hope the battery problems have been sorted out.